Berkeley, CA â€“ 18 July 2011 â€“ Sara Pezzini has been through a lot in the past six years. She’s had a child, maintained her police career while juggling her duties as Witchblade, lost and gained back the mystical gauntlet, hunted down those who kidnapped her daughter, and even discovered the inner-workings of the universe. Her life has been eventful. However, nothing has prepared her for what’s coming next! These changes all start with Tim Seeley (HACK/SLASH) and Diego Bernard (The Man With No Name). 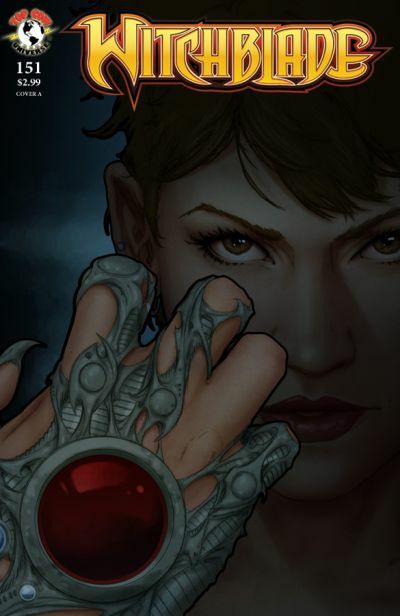 Seeley and Bernard mark the first completely new creative team in over six years following the landmark run by Ron Marz and his co-collaborator Stjepan Sejic. Seeley will be using the Marz-era as a springboard from which to tell stories of Sara’s new life and build on the rich Top Cow history and continuity while bringing a new voice and putting her through new challenges. WITCHBLADE #151 (AUG110425), a 32-page full color comic book, is available for order in the August issue of Previews.